What’s all this noise about Nanny Cameras? So essentially what were talking about today is IP surveillance in the home, or as you may have seen splashed across any and all media outlets, the use of Nanny Cams. The long and short of it is your security and piece of mind when you are away is what I am talking about here. It’s crazy right? No? Well good and to those out there who think its boring and your house and children don’t need a camera watching over them your house probably just got broken into. Ok, that’s a little bit dramatic but seriously you have got to become more hip to your families security, it is 2008. All you need is a camera and a recorder what else do you have to remember? Well a bit so here goes. Well it’s a camera…obviously! It’s a camera that is used to watch over your kids when you are not around (not to be confused with a responsible babysitter of course). 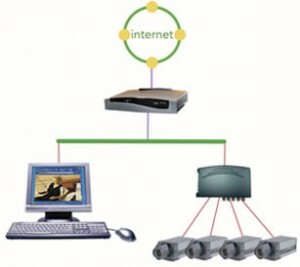 An IP network camera is similar in form and function to an analog surveillance camera in that it captures and sends live video streams, except that with IP Cameras the live video streams are transported via digital packets across an IP network such as a LAN (Local Area Network)or the Internet. Which enables you the parent to log in from work and see exactly what little Timmy is up to. So because IP Network Cameras are on an IP network, the video streams can be accessed and stored remotely. This enables users to view and/or manage the IP camera using a standard Web browser or video management software from different locations, giving businesses increased flexibility and visibility into the lives of your children when you are away or even at your desk at work. It’s piece of mind and it will give you the satisfaction in knowing that the babysitter that you have entrusted the well being of your children with is doing a great job! FPS = Frame rate, or frames per second. 30FPS is generally accepted as “real time.” Most security systems are set to record at 4-7FPS, but can also record at higher frame rates. Think about it like a photographer snapping photos of a scene, taking up to 30 individual digital photos every second. The more FPS, the more bandwidth is necessary to transport the images. We have started a new promotion here at VoIP Supply: Customers will receive a free power supply with the purchase of the Cisco CP-7940G. Check it out here…https://www.voipsupply.com/cisco-cp-7940g. Check it out, while supplies last! Last week I had the pleasure of meeting with Jose Landivar, co-founder of PaloSanto Solutions, an OSS pioneer in Latin America, with locations in Ecuador, Colombia and Florida. Palosanto are the creators of Elastix, an OSS IP phone system and telephony platform derived from Asterisk. Elastix is growing in popularity outside of its native Latin America, and is characterized by its simple installation, clean user interface, integrated Hylafax server (Fax over IP) and virtualization support (using VMWare). Elastic also includes a wealth of integrated software packages including OpenFire integrated Instant Messaging Server, SugarCRM, mail server, billing software and support for more than a dozen languages. PaloSanto is looking to build mindshare for Elastix here in the US marketplace, and they have engineered an appliance specifically for the needs of the application. Jose left one behind after visiting our offices last week, and I am excited to see how it performs. 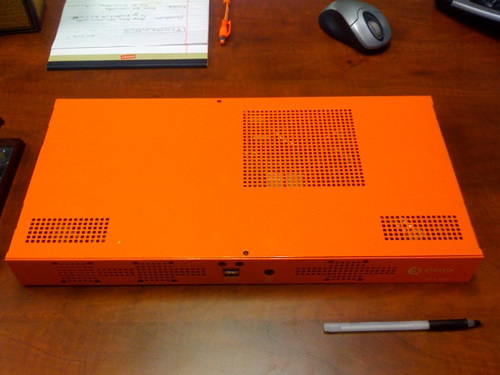 We intend to explore the Elastix phone system appliance in more detail over the next few weeks, and we will share our findings with you here on the VoIP Insider. If any of our readers are testing Elastix, or have deployed it in production, I’d love to hear your comments. Fixed = Like the word implies, “fixed” cameras present a static image view. Fixed cameras are typically positioned and adjusted at the time of installation, as they cannot be remotely manipulated to change their default view. To preface this, the intended audience may or may not be in the VoIP industry, they may work for VoIP Supply or somewhere else, they may even be the owner of their own business. This commentary is stream of consciousness and written to reflect on experiences during the week at my company that I hope will be of use to others in some manner. Your comments, positive or negative, are always more than welcome and highly encouraged as I too love to see things from someone else’s perspective in effort to always being improving. 1) Proper delivery of expectations: Staff needs to know what is expected of them in clear and concise terms, preferably written and reviewed in a timely manner. Ongoing support and coaching to ensure that once delivered, the understanding of the expectations are indeed well known and execution is a simple and easily followed path, are necessary from start to finish but not necessarily in a micro-managed fashion. 2) Follow through on delegation, to get what you inspect, not what you expect: Getting work off your plate is only of value if the results are what you expect and are of value to you such that the work does not need to be redone, finished off, or worse–a complete failure. With regards to delegation of work, you will always get the results expected if you inspect the work prior to completion of the task. 3) Providing just the right amount of rope (not a noose): A truly good manager hires people capable of exceeding expectations and providing enough value that the manager themselves can be promoted and backfill their position with a solid replacement. To do so is to encourage self sufficiency, creativity and opportunity to succeed above and beyond their predefined tasks. Letting staff loose to show their talents and help build the business (should they be motivated to work above and beyond their minimal job description) is critical in developing a team of truly valuable assets. Coach, mentor and follow up with them to ensure that they have not been setup to fail or allowed to wander too far without supervision. 4) Proper message delivery and moderated use of tone: Each team member is different, reacts differently and interprets the manager’s guidance and directives differently. Being sure to deliver the message, positive or negative, in the right medium and with the right tone, is important when hoping to motivate the team rather than threaten them, devalue their work, or create fear of failure and its consequences. 5) Accountability relative to expectations delivered: While I am proponent of positivity, patience and understanding of circumstances beyond the control of the staff member that has been given a particular project or task, holding them accountable remains a necessity. If a task is delivered and accepted, the accepting member of your team must be held accountable for completion of it or communication of its pending incomplete status, reasons for its status and a plan for completion within an adjusted timeframe. 6) Encourage and promote positive two way communications: One of the greatest points of failure in any business is within the internal communications between staff and between departments. It is the responsibility of the management to demonstrate the value and process of effective two way communications, leading by example, coaching and promoting it, rewarding it and ensuring that the team is doing their part within the company. 7) Setting goals and defined points of re-evaluation: Along the same line as setting expectations, the management should be setting goals for celebration of the success of the department. Considering the expectations to be the minimum levels of achievement for the department and the goals are just that, the goals. Sometimes goals are missed and that’s ok, you still have something to shoot for and feel exceptional about achieving. When goals are set too high or unplanned circumstances occur making goal achievement impossible, management needs to set points to re-evaluate those goals and maintain realistic levels so-as to ensure that the goal is not completely unrealistic and therefore not worth striving for. 8.) Leading by example: This one more or less goes without saying, but a good manager needs to lead by example and overachieve those working for them. This should not be confused with squashing the efforts of the staff to ensure that managers continue to look good by preventing others from succeeding. The right thing to do in the situation of a superstar knocking it out of the park is to let them pass and be proud that you groomed such a valuable asset to the company. 9) Understanding the big picture and providing visibility into it: When delegating tasks, assigning team members to a project, critiquing their work, dismissing their suggestions and explaining results and expectations, it is important that the manager understands the overall direction of the company, how their department fits that picture and how the staff fits into the overall big picture of the company. Some are comfortable repeating the same task over and over again while others have ideas and suggestions for improvements. While the suggestions may well be valid and good ideas, they may not fit with the current needs and direction of the company. It is important that ideas and suggestions are not merely dismissed, but shown that the reason for dismissal or non-implementation is that it may not fit the current needs and direction of the company. Thank them for their independent thoughts and suggestions, encourage more of it and educate them on where they should focus their attention relative to additional ideas. …For those of you categorized as a VAR in our economy, why not challenge your associates to read-up on PBXs, switches, routers, IP cameras or WI-FI and have them demonstrate skills and subject mastery by having them instruct their peers? I think you may be surprised by the results and the acquisition of a product specialist. I remember when I used to teach Social Studies, specifically while I was student teaching, a student would come up to me and ask me a question to which I had no idea what the answer was. If this happened in front of the whole class, this could be a source of embarrassment. If it was in front of the class and the principal (who dropped by to observe you) heard you fumbling for the answer…LOOK OUT! Now, that being said, management of the classroom involves several tricks. Ask any teacher and they’ll tell you that you have to know your content, but also have excellent “stage presence”. Stay on your toes and be prepared for anything. When a student came up to me and politely asked, “Mr. L, how did the Versailles Treaty affect Germany after WWI?” I paused for about two seconds and just fired out…. What happened here? Well, students will surprise you with how much they do know, and Jamie answered the question himself. Another student answered Tabitha’s question and essentially taught the lesson for me. My purpose for bringing this anecdote to life is simply to ask if you as a principal and stakeholder at your company are satisfied with the results of on-going training you expect your employees to implement and execute for the betterment of the company. Does the thought of listening to me lecture you on something I know a lot about horrify you? It horrifies me to stand up there for 45 minutes talking until I’m blue in the face, too. That’s right. 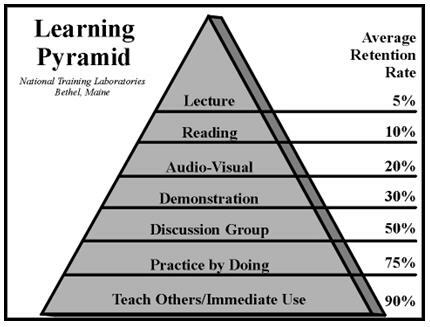 Studies show that the retention of new material increases beyond the archaic lecture. Here at IPCS and VoIP Supply, associates are encouraged and rewarded for “presenting a lesson” to their peers. Teaching others. This does not guarantee that the learner will retain what the associate taught. But it will bear another fruit. By having an associate assume the role of instructor, you will now have a master of a certain subject at your disposal. This associate will now become the go-to, de facto, uber-source of information, data and resources on a given subject. For those of you categorized as a VAR in our economy, why not challenge your associates to read-up on PBXs, switches, routers, IP cameras or WI-FI and have them demonstrate skills and subject mastery by having them instruct their peers? I think you may be surprised by the results and the acquisition of a product specialist. If you have any questions on lesson planning, “tricks of the educator,” or want to talk about the direction of corporate instruction at your company and what has been successful and what has not, please write me a e-mail at [email protected]. An Andy Abramson post pointed me to a piece done by Jeff Belk. The overall premise of the piece was that voice carriers (cell, landline) need to stop focusing on marketing “cheap minutes” that are difficult to use or “expensive minutes” that are easy to use and unlimited SMS plans and shift their focus to making voice calls easier for users, so that calling can once again reclaim the spot of preferred method of communication. I agree with his positioning and the advice he gives to carriers, however I think that the carriers are fighting an uphill battle here. When I was going to college to be teacher, we learned a lot about social development of students and the effects of social conditioning. I am not going to bore you with the scientific details, but essentially much of who we are, how we act and what we become is because of “nurture” or the effects of social conditioning. We learn from and take queues from our peers and those that surround use.